This was indeed a magical morning to be out in Rocky Mountain National Park. 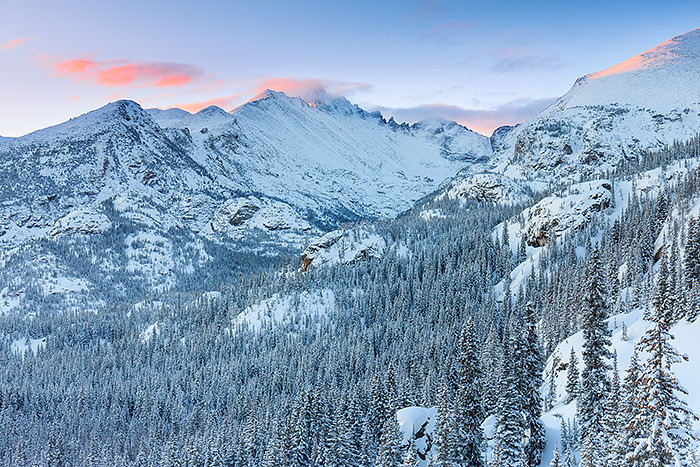 A late winter storm had blanketed Colorado and Rocky Mountain National Park the previous night. Snow covered the pines and the peaks of Rocky refreshing the landscape in a pristine white covering. By sunrise, almost all of the clouds and snow had cleared leaving only a few stragglers hanging over Longs Peak, Glacier Gorage and Otis Peak. With the skies cleared and the sun rising, the clouds and peaks were illuminated in warm red light from the rising sun over the high plains of Colorado. This winter view of Longs Peak is located above Bear Lake and below Dream Lake and making it one of the most impressive views of 14,259 ft Longs Peak from anywhere in Rocky Mountain National Park. Photo © copyright by Thomas Mangan.